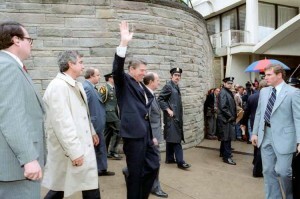 On March 30, 1981, Ronald Reagan, president for merely 10 weeks, stepped outside the Washington Hilton. What happened next was an image millions would soon witness on their TV screens: America’s 40th president raised his arm to ward off a question from a reporter and then, seconds later, bullets crackled the air. Chaos ensued. More than one man hit the ground. The president was thrust into his limousine by a secret service agent who immediately ordered the driver to nearby George Washington University Hospital, where emergency surgery discovered a dime-shaped, razor-thin bullet centimeters from Reagan’s 70-year-old heart. He nearly died. Yet, there was one image we never saw, which Ronald Reagan privately shared several times in the days to come, always with sources he knew to be devoutly religious: his son, Michael; his new pastor at the National Presbyterian Church, Louis Evans; and, among others, some high-profile Catholics — Mother Teresa, Pope John Paul II, New York’s Terence Cardinal Cooke. Ronald Reagan always knew that about communism, and didn’t like it one bit. Maybe God had intervened to ensure Reagan might intervene. Two days after this encounter with a prominent Catholic, Reagan met with a prominent Presbyterian on Easter Sunday. He asked Pastor Louis Evans to serve him communion in the Yellow Room. Evans agreed, and did not speak of the moment for 25 years, until he called me one day in February 2006. As the president gazed out the Yellow Room window toward the Jefferson Memorial, he told Evans that as he struggled for breath on that ER table, he felt that if he did not forgive his would-be assassin at that very moment, he would not be healed. He forgave John Hinckley on the spot. Ultimately, struggling with conflicting emotions — a feeling of grand calling and the inheritance of his mother’s faith-based humility — Reagan would conclude that God had chosen his “team” to defeat Soviet communism. It was a sense of larger purpose he possessed since he was a boy sitting next to his mother in the pew at Rev. Ben Cleaver’s First Christian Church in Dixon, Illinois, not to mention as he sat perched at a lifeguard stand at the Rock River in Dixon, where he assumed a duty of rescuer that never left him. For the record, Reagan committed himself to the great moral good of taking down a genuinely Evil Empire responsible for the deaths of tens of millions, infused by an ideology that killed over 100 million worldwide in Reagan’s century. It’s a moving story of one convicted man vs. one pernicious ideology. Although no one else said it, certainly as audaciously, nor expected it, those last pages were at that time being written. In fact, that statement foreshadowed Reagan policy: he would not seek to contain communism; he would undermine communism. For Reagan, this was a cause and a calling inseparable from a faith that carried him from February 1911 to June 2004, both outliving and transcending the atheistic ideology that Lenin and his Bolshevik minions had thrust upon the world and the 20th century. Ronald Reagan’s religion was at the crux of his crusade for freedom and against a very real evil. And for Reagan, it was a bullet fired 30 years ago this week, March 30, 1981, that provided sharp clarity to that sense of direction and purpose. V&V Editor’s note: This article is adapted from a previous version published by the Reagan Centennial edition of Newsmax.